1. Heat your Palm, Coconut and Canola Oil up in the microwave or in a double boiler until they reach a temperature of 115 degrees Fahrenheit. 2. With all your SAFETY GEAR on (don’t know about safety gear? 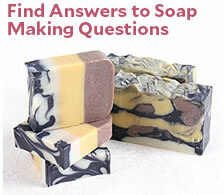 You need to research cold process soap more – suggested reading material is Susan Miller Cavitch’s “The Soapmakers Companion”) pour the pre-measured lye into 11.9 oz. of distilled water. 3. Mix in a glass or unbreakable, heat-friendly Pyrex bowl with a stainless steel mixing spoon. Do NOT breathe the lye fumes. This mixture will heat all the way up to approximately 180 degrees Fahrenheit. 4. Cool this mixture to approximately 115 degrees. 5. When both the oils and the lye water are within 10 degrees of 115 degrees, pour the lye/water mixture into the melted oils. 6. If you have a stick blender, now is the time to use it. If you do not have a stick blender, hand stir with a whisk or stainless steel tool. If you’re using a stick blender, you should see trace (the point where you can see faint soap trailings when you drizzle the mixture over the surface) within 5 minutes. If you’re using a hand propelled mixer (a spoon), this process could take up to a full 3 hours. 7. Once you’ve hit trace, add your clay and mix in well. Wait for a minute to make sure that the soap is fully traced and is not going to separate in the bowl (and thus, in your molds). 8. Pour the thick, white, creamy soap mixture into your molds. 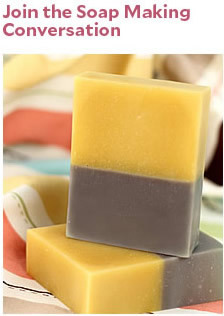 Your soap will need to sit out for a full 6 weeks before using.